So strange. 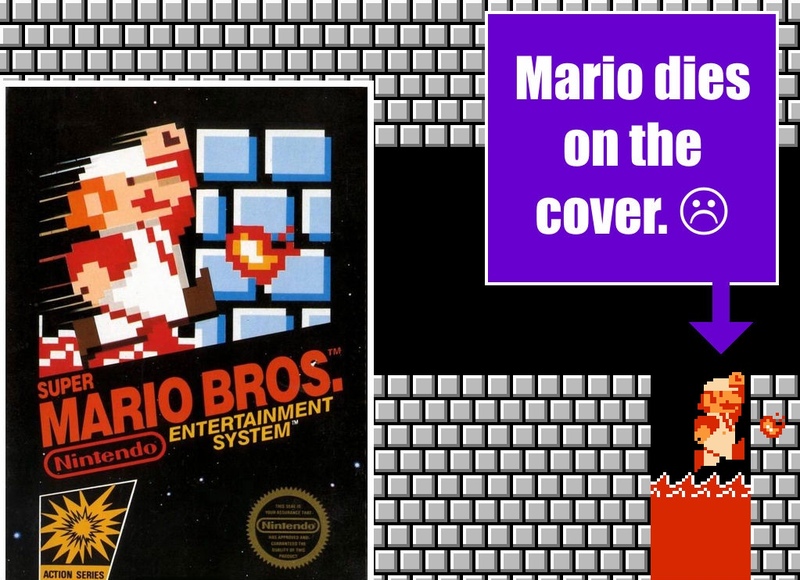 I wonder why Nintendo would kill Super Mario on the cover of his first game. In case your not familiar with the game (which you should be, if you’re not), Mario is about to fall into a pit of lava. I don’t know the original source of this photo, so I’m sorry I can’t credit you, who ever you are. 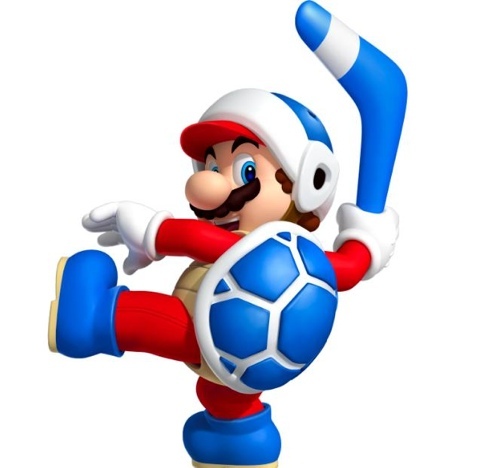 Tags:Mario, nintendo, Super Mario Bros. 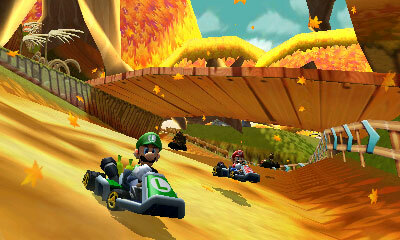 I played two tracks on Mario Kart 7 during my brief time with it at Comic-Con. I wish I could have played more, but there were so many other games to try. I played the underwater track and the Donkey Kong Country Returns based track (courtesy of Retro Studios involvement in the game). Both were pieces of excellence. 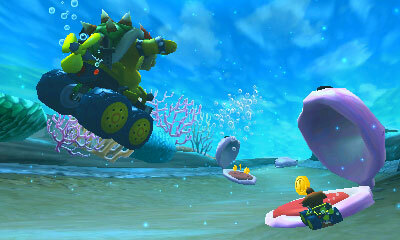 The 3D greatly improved Mario Kart 7. There were many subtle things, and many massive/in your face things. In many cases the subtle things seemed to be better. For one, when I was driving through the course, my little character (I was playing as a Koopa) looked behind his kart at me, and his little face stuck out of the screen. Not by much, but still very noticeable. There was no blur, just a crisp Koopa face staring at me. Sure there were bigger 3D things (like the blooper ink spraying in your face), but I found all the small things particularly eye catching. Of course there is depth too. When you look ahead you feel the expanse of the track. It really helped judging distance and added a whole new element to the amazing virtual mushroom kingdom. Main gameplay is set in standard Mario Kart style, but there are a large number of new features (customizable karts, kites on karts, and underwater karts) and one major returning feature that hasn’t been around for a long time (coins that increase your speed the more you collect). I can’t really talk about the customizable karts because I didn’t get the chance to build my own kart, although I’ve heard it works very well, and the giant kart someone had created before me was quite awesome. Let me go into detail on the other features. The kites on karts gimmick works really well. 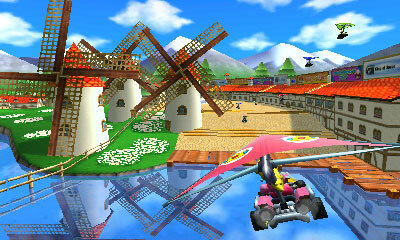 For those of you who have no clue what I’m talking about, in Mario Kart 7, when you catch some air after going over a ramp, your kart sprouts a kite that allows you to fly back down to the track. It’s a great change of pace from standard driving and a lot more fun than I thought it’d be. Also, I can see how you could really shave time off courses by cutting corners with practice. 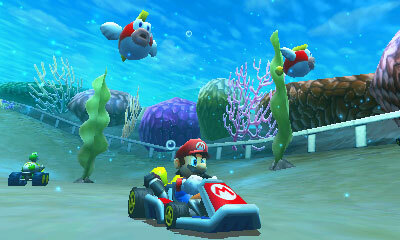 In Mario Kart 7, when your kart goes underwater, it sprouts a propeller/jet/thing that propels you forward. Underwater you move much slower, which gives you more time to avoid the giant cheep cheeps and clams. The under water level I played had particularly good 3D effects. Bubbles and such were very pronounced. 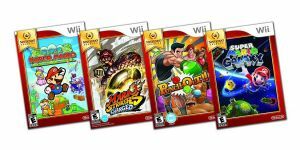 Coins have been in only 2 of the previous 6 Mario Kart games (Super Mario Kart and Mario Kart: Super Circuit) and not sense the Gameboy Advance. 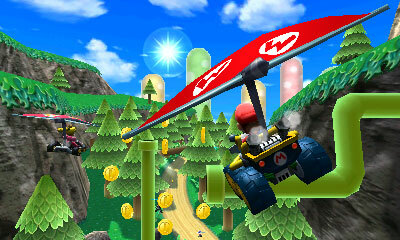 Like I said before, coins in Mario Kart 7 increase your speed. The effect is noticeable, and occasional influential in getting that last bit of speed. I am happy to see them make a comeback. Next year at con, if Nintendo has a lounge, you’ll find me there for at least a few hours. There was so much competing for my attention, but the two tracks I did play made me want more. The two tracks, the one that was under water and the track based on Donkey Kong Country Returns, were both well designed and very memorable. The underwater track was full of life and had some nice branching paths. 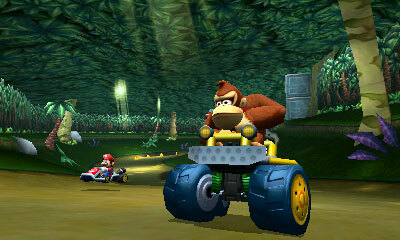 The Donkey Kong track used enemies from Donkey Kong Country Returns and was super fun to race on. Other tracks include one where you race on Wuhu Island (from Wii Sports resort, PilotWings Resort, and Wii Fit) and some great “retro” courses including Maple Treeway from Mario Kart Wii (which is one of my all time favorite tracks) and Luigi’s Mansion from Mario Kart DS. 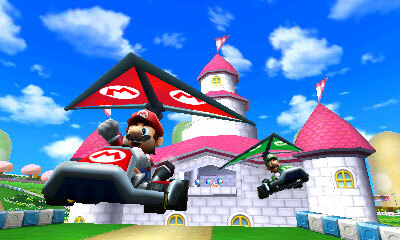 Everything in Mario Kart 7 seems to offer the complete package. Graphics, gameplay, and many new goodies. I can’t wait to play it more after it is released this December.